The FIFA World Cup of Football is almost upon us and this has given us the perfect opportunity to have a go at writing some fun and adventurous football related poetry with the children in our primary classes. Football! Some of us love it, some of us hate it. It’s a myth that football is only popular with the boys in our classes, lots of girls like it as well which is why I’ve decided to include it in my poetry writing ideas blog. Football In The Living Room is a journey into how playing football in the wrong place can lead to disastrous and funny consequences and this got me to thinking about a football poem in all kinds of very unlikely settings like: space, the jungle, a shopping centre, a swimming pool, under the sea!!! etc. Football’s great out here in space! Football at the North Pole! The structure of this poem is very simple. Each verse consists of four short lines with 2 rhyming couplets i.e. the rhyme scheme is AABB. 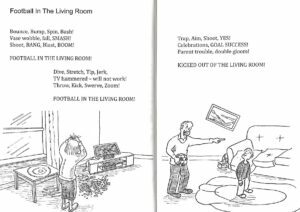 The challenge for your children in this poem is to find the rhymes and then think of ingenious places to play football. Their poems could be set just in one place or for more of a challenge they could switch settings in every verse. Encourage your children to use lots of verbs when writing their own versions, get them to think carefully of how your body would move in the different environments i.e. you would move/ feel a lot different playing football in a desert than you would on an ice rink. This poem would also be great for illustrations and would look great in a class anthology. 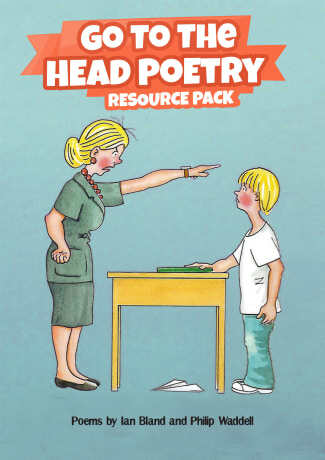 Click here to download a free and pre prepared writing framework for this poem.